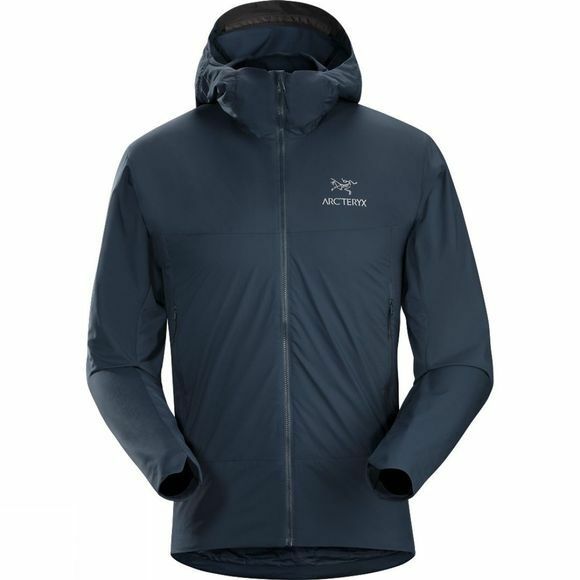 The Men's Atom SL Hoody from Arc'teryx is an essential piece of insulation that is ideal for high intensity activities and activities in changeable weather. Utilized by climbers, hikers and travellers around the globe, the Atom SL Hoody is a lightweight and extremely breathable midlayer. The strong Tyono™ 20 nylon shell has been treated with a DWR coating to provide protection against drizzle. The Coreloft™ insulation is only placed where it's needed most to reduce bulk; the Hoody provides warmth comparable to a lightweight fleece but its innovative design makes it significantly lighter and more compact. Lightweight, air permeable fleece side panels allow excellent breathability and help to regulate your core body temperature. Articulated, mesh lined sleeves and gusseted underarms mean the Atom SL won't restrict you during physical activities. The StormHood™ is uninsulated to minimize bulk and can fit over a helmet, and provides protection against wind chill and light rain. The chin guard and wind flap and the adjustable hem drawcord help to keep cold air out and the two pockets are perfect for warming up cold hands. Whether you're preparing for a high altitude trek or scaling a rock face, don't forget the Atom SL Hoody.